Hello everyone, long time no see. I used another angle, not that of an actor to view video in a new perspective. I realized that this product was the result of the effort of many people whom I do not know. It does not only apply to the Entertainment industry, i am sure it applies to other occupations too. Everyone has their own responsibility. Thus, when we gather all these responsibilities together, it becomes a product. Perhaps, there are responsibilities in all sort of measures be it big or small. Despite that, everybody has a part to play to accomplish the product. Although I have been placing my emphasis on being an actor till now, I am still interested to know more about film making. Therefore, recently I have been experimenting with camera. Instead of fliming a video, I started with photography. 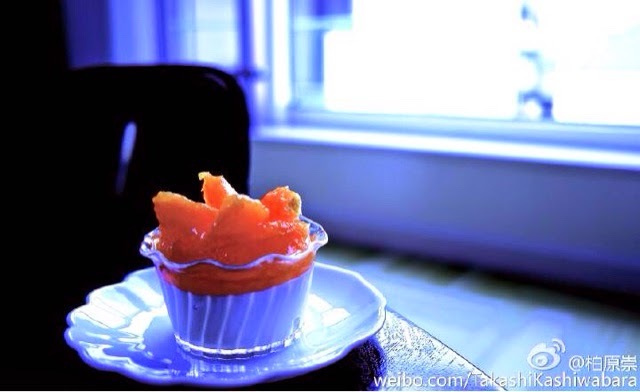 This is just an ordinary work, but i wanted to upload a picture of the dessert which was sent to my friend house. When do you take photo? When you are with your friends, eating delicious foods, with beautiful sceneries, with someone whom you treasure... It is indeed meaningful to capture those precious moment. Drama or movies were interlinked to these photographs.